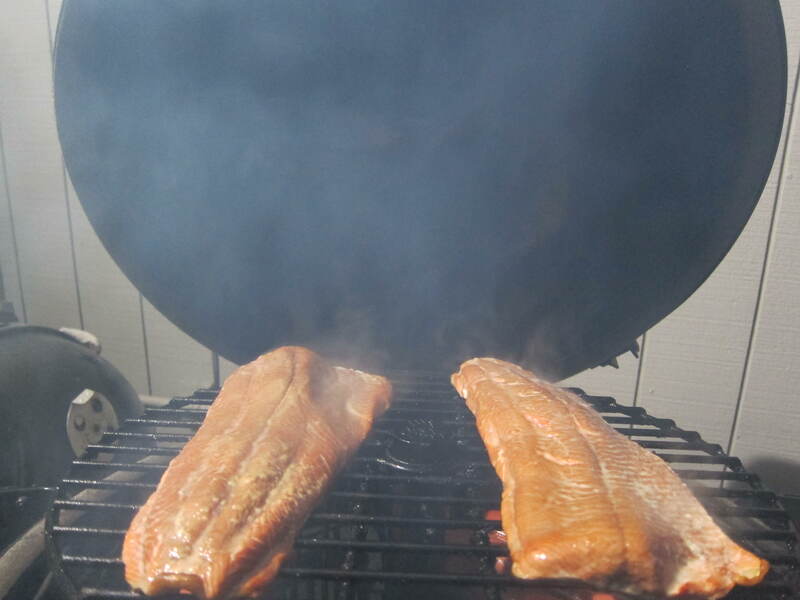 After thawing 6 large frozen salmon fillets overnight ( = 3 Alaska red salmon from our catch last season), Brian started up the grill at a low temperature with plenty of pecan smoking wood chips. Once he got the grill nice & smokey, he smoked the salmon for about 15-20 min on a low temp, keeping the fillets skin-side-down. Once they were toasty brown from the smoke, but still fairly rare inside, he took them off the grill and brought them inside. We prepped & sterilized 16 pint jars. 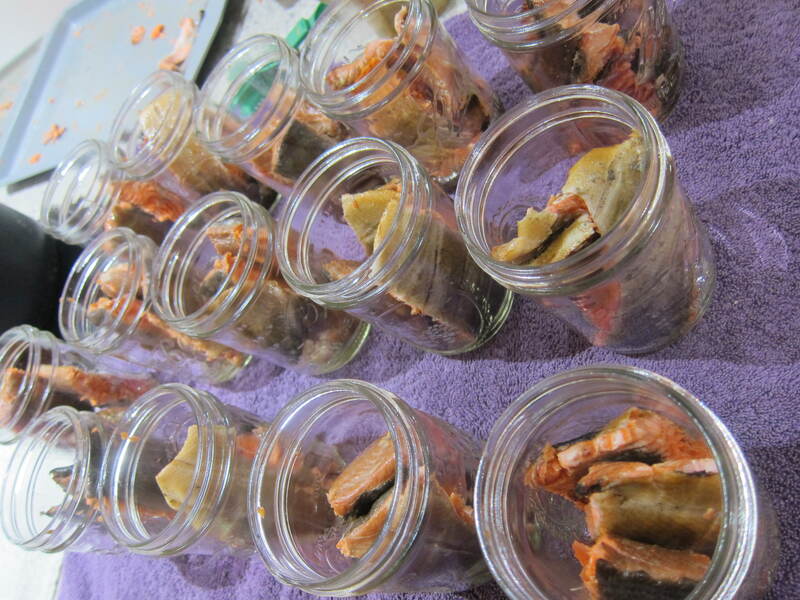 Then we cut up the smoked salmon fillets so they were jar-length, and stuffed each jar. 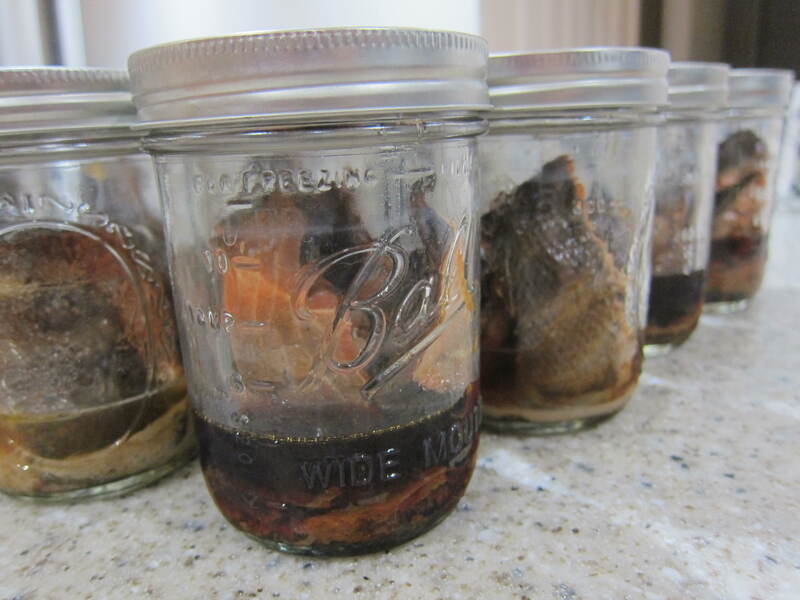 We left the fish skin on – it’s super easy to just peel off after the jars are processed. I love canned salmon for many reasons – being able to make delicious organic fish shelf-stable is just one of them. 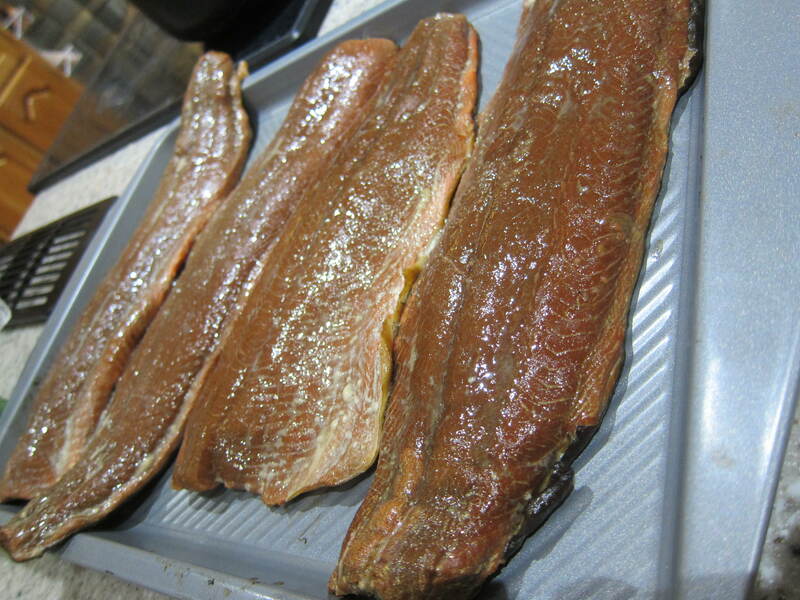 We followed the canning instructions, “home canning smoked fish,” from the University of Fairbanks, Alaska Extension Office, which says to process our pint jars for 110 minutes at 10 pounds pressure with our weighted gauge canner. After the pressure canner completely cooled down and returned to zero pressure, we had to use this little trick to get the pressure canner lid to open. All of the jars successfully sealed. 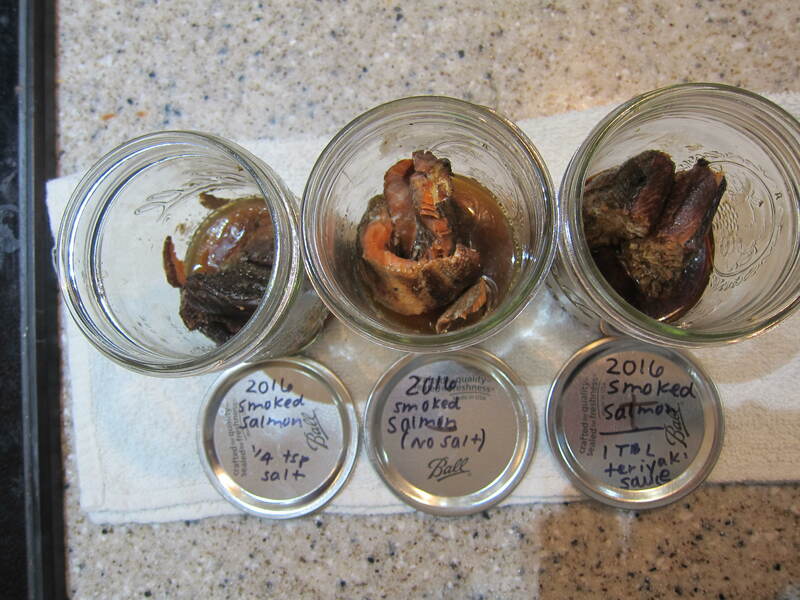 A few days after processing the pecan smoked salmon, we popped open one jar of each flavor to do some taste testing & determine which recipe was our favorite. Recommend to a friend? Yes! This recipe combination was our favorite! With adding just 1/4 teaspoon of salt and a splash of organic olive oil, it really brought out the rich flavor of the smoked salmon while keeping the meat more moist than the other recipes. Recommend to a friend? Sure. Keeping the jars pure without adding any extra wasn’t too shabby, but the salmon didn’t turn out quite as moist or flavorful as the pint jars with the touch of salt and oil. Recommend to a friend? Only my enemies. Bleh. I won’t try adding teriyaki sauce to my canning recipes again! It was amazing how the teriyaki flavor changed after being processed in the pressure canner. We both love teriyaki sauce on grilled meats, so we were expecting our jars of canned salmon to be reminiscent of teriyaki grilled salmon. Nope! It tasted rather heavy yet bland, and also turned the salmon color very dark. The flavor wasn’t disgusting, but it wasn’t as good as the other two. Won’t be trying that again.